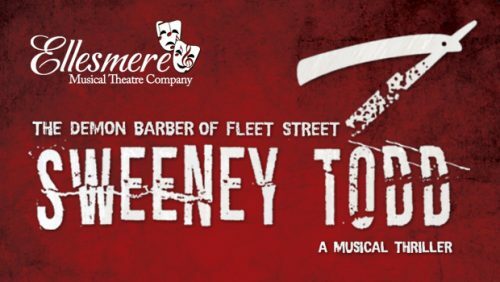 ***** I always love a sneak preview and am a fan of gruesome musicals, so was delighted to be in the audience for the dress rehearsal of Ellesmere Musical Theatre Company’s latest musical Sweeney Todd: The Demon Barber of Fleet Street. Sweeney Todd, Stephen Sondheim’s most successful show, promises to blends music with melodrama and plenty of black comedy in an extraordinary tale of obsession, morality and greed. The musical tells the story of a barber, who unjustly exiled by a wicked judge who covets his wife, returns with a dark desire for revenge and finds an ally in the unscrupulous Mrs Lovett, who cleverly seizes on the opportunity of a new source of meat for her pie shop. This exciting departure for Ellesmere Musical Theatre Company transported them from a strong company to a superb company that would not be out of place on a professional stage. Full of amazing voices and performances, the production showcased the cast and musical theatre in Sheffield and beyond at it’s best. Not for the faint hearted, the dark musical opera will leave the audience feeling uncomfortably mesmerised and not able to take their eyes or ears off the stage. And as well as all that, you will leave the theatre knowing the secret of how to make a good meat pie. As someone new to the musical, I discovered unexpectedly that at it’s heart the musical is not a tale of gruesome murder, though of course this forms part of it, but of love, friendship, family, insanity and good marketing. In the lead, Phil Probert as Sweeney Todd perfectly balanced the East End hard man you would not want to meet in a dark alley with charm and an unexpected sympathy in a performance full of passion and emotion that seamlessly moved from spoken to sung word. Opposite Todd, Louisa Doody as Mrs Lovett played the part as the original East End matriarch, wonderfully maintaining her character and accent through her musical numbers. Louisa and Phil’s entertaining duet “A Little Priest”, will leave the audience feeling wrongly hungry, before she showcased her inner Nancy from Oliver in “God that’s Good” and providing the warm-hearted seaside postcard equivalent of the working class romantic dream in “By The Sea”, that would work equally perfectly as a stand-alone number. However the most memorable performance of the night came from Carol Wibberley as the Beggar Woman, perfecting growing craziness and insanity with knowing and likability and, thanks to the talents of the make-up and wigs team, extraordinary hair and makeup helping make her completely unrecognisable from anyone who knows her or has seen her perform before. In a dark and haunting production the young love between between the innocent Anthony Hope, played by Sam Widdowson, and Johanna, played by Sara Hibberd, was captured with beautiful, innocent chemistry and stunning voices that would have been snatched by Rogers and Hammerstein, whilst their performance of the cleverly arranged “Kiss Me” will remain one of the best musical duets I have heard for a long time. Others amongst the excellent cast who deserve a special mention include Jeremy Craven as Judge Turpin whose leching over his ward Johanna will make you feel dirty whilst his operatic voice displayed at it’s best in “Pretty Women” would not be out of place in a Gilbert and Sullivan production; Alexander Hayward-Browne as Adolfo Pirelli who as well as displaying fantastic Italian and Irish accents also possessed the most powerful operatic voice of the performance, though his shaving competition scene opposite Sweeney Todd made me grateful to be a woman and never need a close shave; Joe Hamilton as Tobias Ragg, who lovingly combined loyalty, protectiveness and not being as naïve as he seems, all wonderfully showcased in “Not While I’m Around”; and David Jefferson as The Beadle who played the role with an air of respectability whilst in “Parlour Songs” displaying a cathedral worthy vocals. I must also mention the ensemble’s crisp performances and arrangements that remained strong throughout, with their powerful snippets of the continued “The Ballad of Sweeney Todd” reflecting the public’s own reaction to the gossip and media scandals that would surround the likes of Sweeney Todd. In this stand-out musical, the scenes that will stay with me for a long time were the vision of what happened to Sweeney Todd’s wife during Mrs Lovett’s performance of “Poor Thing” that was both visually stunning and nightmare inducing; the haunting asylum scene that showcased the ensemble’s acting abilities at their unsettling best; and, in a dark and terrifying production a finale that will still shock the audience as the terror and insanity reaches its petrifying conclusion. Off stage, I must highly praise the nine piece band, whose incredible playing maintaining the tension and atmosphere throughout; the set design and lighting teams for their dark and gritty set and lighting that perfectly captured and transported the audience back to the horrors of 1930s London; the set team especially for their clever use of the barbers chair and raised floor in the second act; and the crisp and clever direction and choreography by Jeremy Tustin and the stunning musical arrangements throughout thanks to musical director Gavin Usher-Schofield, that between them turned the script of Stephen Sondheim into this unmissable production that should be seen by all fans of musicals and dark tales. 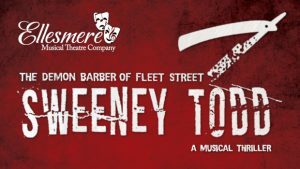 Sweeney Todd is on at the Montgomery Theatre, Sheffield from Wednesday 25 to Saturday 28 April at 7.15pm, with an additional 2.15pm matinee on the Saturday. Tickets are £15. To book email ellesmeremtc@gmail.com, telephone 07510 289036 or visit http://themontgomery.org.uk. Formed in 1947, Ellesmere Musical Theatre Company perform an annual musical plus a performance of show stopper tunes from musicals at the Montgomery Theatre, Sheffield. For further information on Ellesmere Musical Theatre Company visit www.ellesmeremtc.co.uk, like on Facebook at www.facebook.com/ellesmeremtc, follow on Twitter at https://twitter.com/EllesmereMTC or follow on Instagram at www.instagram.com/ellesmeremtc.